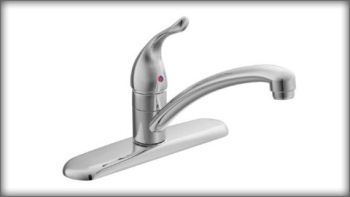 Voucher good for Moen 7425 Chateau Single Handle Kitchen faucet, Chrome. Installed. Valid for customers in a 50 mile radius of Sal’s North Royalton location. During normal business hours. Must be direct replacement. If not, additional costs will apply. Sal's Heating & Cooling reserves the right to determine if application is accommodating to install products. Sal’s Heating and Cooling will come to determine size of equipment needed. This warranty is transferrable. All permits if needed are additional, no exceptions. Tax not included. Not valid with any other offers. voucher has no cash value. Please note and be advised that due to the requirement of the holding of a State License and code requirements, ANY item purchased MUST be installed by Sal's Heating and Cooling Inc. and are not available for over the counter purchase or receiving. Any voucher purchased will not be available to be used on Sale Items or available in the event that the current Model # advertised is no longer available by Sal's Heating and Cooling Inc. or the manufacturer. We will determine which comparable or closest model to use when installation is scheduled of the item purchased. The voucher must be provided before the estimate, installation or contract is signed or current estimate will be in force and voucher can be redeemed at a different time. Weather permitting, excludes emergency installations. All installations will be done during normal business hours and subject to availability and scheduling. Any code upgrades, city permits, registration fees will be additional and be quoted at the time of the estimate or installation. No exceptions.